Ethan really loves having a bag with him at the moment. 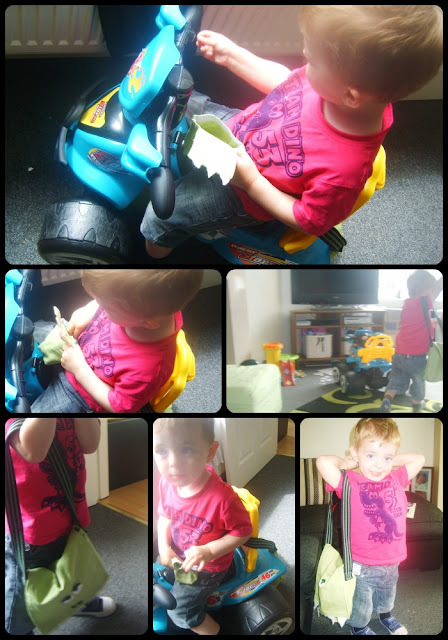 He uses his flynn rider bag sometimes, but it's just not big enough for all his treasures! :) Plus we're going away soon and it would be nice for him to carry a few things with him too! So I decided to make him his own messenger style bag, but with a twist especially for my little dinosaur loving boy! It even has a secret pocket especially for treasures/treats to be hidden away from an older sister. The bag is made really similarly to this Flynn Rider bag, but bigger and lined. If a step by step for this would be useful let me know! as he had been using Izzy's pink spotty one. Poor boy. But now he loves having his own big-boy bag and wallet! That is so cool, what a great idea. We too have a dino loving little boy who loves to carry a bag around, unfortunately we only have his sisters' pink handbags so think I may have to attempt one of these. (He has the same dino t-shirt too!) As this is my first time can I just say I love your blog, you have some fantasic makes. OMG I definitely want to see the step by step! I need to make one of these for my husband, he would love it! He likes to take a bag to work with him, but all the ones we have are like full on briefcases that are giant and bulky and made for laptops, so not ideal. Thanks for sharing at The Fun In Functional! Oh hippo themed would look great! With two big teeth! Such a good idea!